In just ten short minutes you can create this Instant Pot Mongolian Beef recipe that will blow your mind. A little sweet mixed with savory and that creamy sauce makes this Mongolian beef a must make dinner this week. If you have been around my blog you know I love creating dishes that taste even better than take out, like my General Tso’s Chicken, and my Better Than Take Out Beef and Broccoli. It gives you that better than restaurant quality without having to leave your kitchen! And if you have any leftover, you can save it for the next day! This instant pot dish is sure to become a new favorite dish in your home like it is in ours. You can serve this alone, on a bed of rice, or even a side of noodles. I like to mix up how I serve it just for variety and also what items I have stocked in my pantry! I am a sucker for that sweet and savory factor of this Mongolian Beef. The brown sugar paired with the garlic, salty soy sauce creates this creamy sauce that is insanely addictive. Each bite is just bliss for me; I could eat the entire pan if I don’t control myself. It is one of those foods that even if you aren’t hungry, it would be hard to say no too! Do you have food that you can’t resist? I like to have the butcher thinly slice my steak, or sometimes you can buy packages of it pre-cut at your local stores. Now if you cut it consider cutting the steak pretty thin, this helps it cook quickly and soaks up even more flavor from the sauce. Now you can use light or dark brown sugar, and I find the dark brown sugar adds a new dimension of sweetness that you don’t get with the light. Either works but if you do have dark try it and see how you like it! Cornstarch is a must if you change out for flour you will not get the same results. It will be more of a mushy mess and won’t have that saucy texture. Lastly, I love using fresh garlic because it adds that pop of garlic to the dish. I find using pre-minced or even dried doesn’t give you that same richness. Now if you don’t have fresh by all means, you can use what you have, but you might notice it lacks a little in the dish. I think you guys will devour this dish! It is one popular dish here on Adventures of a Nurse! 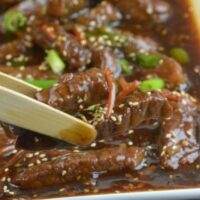 Yummly In just ten short minutes you can create this Instant Pot Mongolian Beef recipe that will blow your mind. Add oil, steak, and garlic. Pour in carrots, soy sauce, brown sugar, and water. Just a question. How thick should I cut the flank steak for tender meat? We LOVED this. Tastes every bit as good as take out and probably better. Thanks for the recipe! This was absolutely delicious!! I followed your recipe exactly except I added a small amount of barely steamed broccoli in the end. 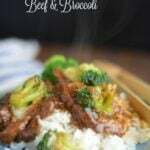 Thank you so much for this better than any restaurant Mongolian beef recipe!! I made this tonight for our 2nd instant pot meal ever! It was fantastic, I added broccoli in the end. I think next time we’ll do mushrooms and snow peas. It was faster than delivery and just as good! Made this tonight, I didn’t have carrots so I added frozen stir fry veggies (that I steamed in the microwave first) at the end after adding the cornstarch. Also I used a sirloin cut of steak because it was what I had. Absolutely delish! So easy and family asked to put it in the rotation. Thank you! Made this today in my Instapot. Fas, easy and delicious. My husband loved it! Making this tonight but question, do you cut flank steak before you cook it or after? Does not say. Cut the steak before you cook it. This was excellent! Family loved it. 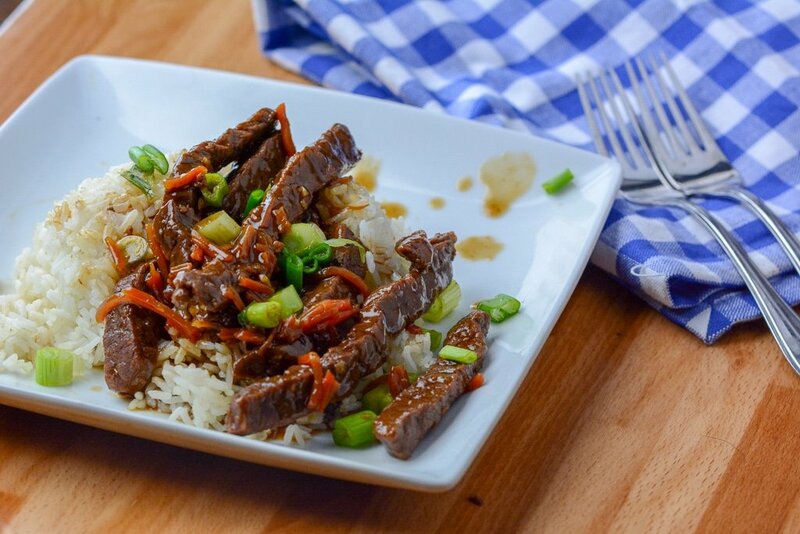 I was starting to think this new appliance just wasn’t going to be my friend, as nothing I had made so far was impressive – until this Mongolian Beef. Yum Yum YUM. I also added snow peas and water chestnuts. I think next time, I will add the snow peas at the end because they were way overcooked. I also served with a mix of brown rice and cauliflower rice. Thank you for such a great recipe! I bought the cheapest chuck roast with a lot of marbling because the flavor and texture after cooking is fantastic! I’ve made this twice so far and it’s the quickest most delicious beef dish you can make in this pot….hope this helps you! Made it as written and it was very tasty, but next time I will use half the brown sugar. DELICIOUS!!!! But my sauce is not thickening up and is runny.. even after sitting for 5 minutes! Any help? Quick question…Do you cook the meet on sauté first and then pressure cook it as well? Same question – do you sauté and once finished, then add veggies or turn to sauté add, everything and immediately change to pressure cooking? When you say set to saute, should you then Brown the meat, then set high pressure to 10 mins.? I checked on google and it seems that sauté is to brown with lid off, with oil and garlic. Then add rest and pressure cook. Why are there sesame seeds in the picture but not the recipe? One of my favorite recipes made in the instant pot to date. I will make this weekly until my husband gets tired of it ? Carla there seems to be an error in the directions with the html coding. Just letting you know. Made this for dinner tonight…sooooo good. First time we’ve ever had it. I recommend you take some liquid out of pot and whisk with corn starch before adding to broth and beef mixture. This will avoid lumps of corn starch. I also used thinly sliced carrots instead of shredded. Hi!! Loved your recipe, only thing I did different was to use top round(a little cheaper ;)) and reduce the sugar by half! Came out tender and flavorful! Will definitely make again! In the last few days I’ve made two of your recipes…this Mongolian Beef and your General Tsao’s. Both of them were SO tasty and SO easy! Made this today with brown rice and quinoa. Came out GREAT! A definite make again. This was FANTASTIC!!! I substituted stew beef and it worked out fine. Im starting to see instant pot recipes everywhere. I dont have one but im ready to go shopping. Do you recommend one or are they all the same. I love your recipes. This Mongolian Beef sounds and looks delicious but it says spicy. I didn’t see anything spicy in the recipe what would you recommend to spice it up a bit. Thanks can’t wait to get my pot and try it out. Delicious. 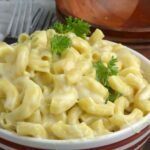 I used my instapot for the very first time, and made this recipe. Great! This was so good and so easy to make! I used round steak instead, and just cut it into 1×1” cubes. My whole family enjoyed it, so I will definitely be making it again. Thanks for sharing this recipe! One recipe if never enough! Always have to make at least two. Small adjustments for low carb like using arrowroot instead of corn starch and using trivia brown sugar but only 1 told per recipe. Yummmmmmy!! One recipe if never enough! Always have to make at least two. Small adjustments for low carb like using arrowroot instead of corn starch and using trivia brown sugar but only 1 tbls per recipe. Yummmmmmy!! Would this be able to be made on slow cook? If so, What would you recommend for the setting and amount of time to cooking? Thank you in advance! Made this for my husband using my pressure cooker. Every bite, he looks over at me and says how delicious is! “place pot saute”-what does that mean? How long do I saute it before I add the other stuff? This is a good recipe and hard to mess up for novice IP users. Flank steak has gotten really expensive here (upwards of $11 a pound) so I mostly use sirloin or top round for this and it comes out delicious regardless. 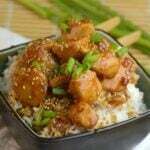 I also use low sodium soy sauce and cut back abit on the brown sugar. Thanks! This was my first attempt with the Instapot. It was delicious. The only thing I changed was broccoli instead of carrots. Boy, they really disintegrated…lol. Carrots next time. 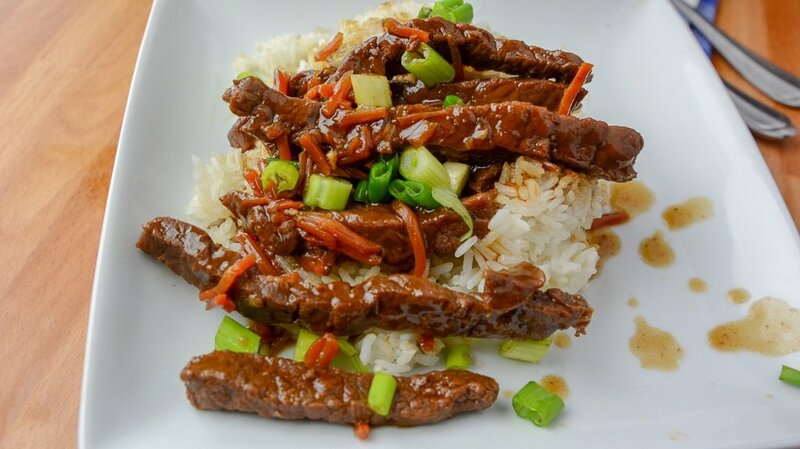 You have knocked it out of the park on this Mongolian Beef! I have tried so many recipes and for whatever reason, I tried this one. It is absolutely fantastic. Because this is such a hit, I will move on to General Tso (which also has been a dismal failure. )I can’t wait! Thank you for sharing your recipe. This was great, we did cut the brown sugar down and it was still sweet. Just made your Mongolian beef and I’m sorry I can’t post a picture. My partner and I ate every single bit of the four servings. I’m a CNA and my partner is a cardiac catheterization lab tech. Needless to saywe are on call all the time and this kind of recipe is just what the doctor ordered.? This recipe was so super easy to make and it was my first attempt at using the instant pot. I did reduce the brown sugar by half and added canned mushrooms. My husband wants in this one in the rotation. Thank you! I am fairly new to this Instant Pot which explains my question. The first step in the instruction is “PlacepotSaute”. Does this simply mean use the sauté function and place the beef, oil and garlic in the pot to brown? Food was good but how come the cook time says 10 minutes and then the recipe instructs you to cook the food for at least 13 minutes? Made this last night and my boyfriend said 10 out of 10! I loved it too and cannot believe how quick and easy this was to make. Thank you for the recipe!! Wonderful recipe but missing the heat (I added about 1/2 tsp. of red pepper flakes). Also missing is the green onions cut on a diagonal and sliced onions. I added these after the quick release, and before the cornstarch. I will be adding this to our dinner rotation. Thanks for a great recipe. This was really, really good! Hubs loved it. I also steamed some broccoli & added it the the pot after adding the cornstarch. The broccoli was delicious bathe in the thicker sauce. My only complaint was it was a little too salty. Told hubs next time I will get some low sodium soy sauce. His response was nooooooo! I will just added 1/2 cup soy sauce & 1 cup of water. Also will cook for 15 min rather than 10 min. While the meat was very tender it was not fork tender. Made this tonight with flank steak, followed the recipe with only minor changes. I added 1/2 of a small white onion sliced thin while browning the steak with garlic. After QR I added some cut snow peas and some thin sliced water chestnuts to add a nice crunch. Thickened the sauce and served over jasmine rice. Even my picky eater ate it and said he would eat it again! Thank you!! This was awesome!! My 9 year old absolutely devoured it which impressed me because he’s a picky eater. I had to modify it because I could only fine .88 pounds of organic stewing beef. I just sliced it thin as you suggested. I had baby carrots, so I quartered those, and used 2 tsp of smashed garlic, the sesame oil. 1/2 cup of light brown sugar. Just under 1/2 cup of soy sauce and 1/2 cup of water- had to use 3 tsp of corn starch. Topped it with sesame seeds and some jasmine rice. Delicious!! What does “placepot saute” mean? You share so many great recipes that I would love to have in my recipe box but since you do not include email amongst your ways to share on FB, I can’t get them. I realize email is almost a thing of the past, but there are some of us just not computer savvy. Is it possible to include email as a way to share? TIA. Your picture shows green onions and sesame seeds. When and how much do you put in? Used round steak cut thin frozen across grain, perfect! Also, used liquid aminos in place of soy sauce, also great! Didn’t have sesame oil so used canola, which was also good! Served over rice and sprinkled chives from my garden. Only real change, I’d julienne the carrots instead of shred. This is a keeper recipe for sure!! Thanks!! This was DELICIOUS! I subbed soy for teriyaki and it was perfect! all that soy sauce sounds like it would be salty??? I made this today. First time using the instant pot. It was delicious and super fast. I think next time I will add green pepper and onion. Excellent recipe and tips were great! We will make this again. We served this with brown rice and steamed broccoli. Yum!! A HUGE favorite in our house! I thin slice the steak and saute just until brown. I don’t add carrots before pressure cooking as the first time we did this, they virtually disappeared. Instead I will either saute some onions, carrots and snap peas while the meat is cooking and throw them in just before serving, or will add a bag of frozen veggies after the cornstarch, they warm up very quickly. So good, everyone also has seconds and fights over any leftovers… usually there aren’t any! Do you actually sauté in sesame oil? I thought it had a low smoke point, and was best to be added at the end of cooking just for flavor. Delicious thanks!! I just cut the sugar and added broccoli at the end. Keeper! Only recommend that you are more complete in written instructions. Kind of hard to interpret some, but through other comments figured it out! Enjoy your recipes a lot! The recipe calls for beef broth but then it’s not in the instructions; it says water in instructions but not in ingredients list. Does the sauté take place for a certain time frame or just dump everything in right away? Is the garlic chopped or just thrown in whole? Quest ~ the ingredients say 3/4 beef broth & 3/4 soy sauce for the liquid. However, while preparing to put everything in InstaPot it says to add water in step 3. Where is the water listed & what happens to the beef broth? How much water should be added? Directions say to add water but water not listed in ingredients. Thanks! I tried this tonight, it was delicious, but since I would prefer less sodium, my beef broth was the 50% less salt kind. As for the brown sugar, I cut the recipe to 1/2 cup and family thought too sweet. I used 1/2 cup sodium reduced soy sauce. I also added more veggies, but still not enough. I think this is a good recipe but next time I think I will add more veggies during the last saute thickening and maybe a little red pepper flake for a bit of spice. I had begun with the carrot, green pepper and onion in the beginning and they were almost non-existent in the end. I added some broccoli at the end when sauce was thickening. When do you put in the beef stock?